This screened in porch in Columbus, OH with an existing concrete patio was artistically beautified with decorative saw cuts and acid stained using Scofield stains in custom mixed colors. Get this look using Cohills Metal Essence metallic epoxy and H&C Concrete's SharkGrip. 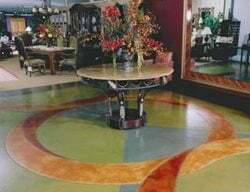 This custom design was saw cut into the concrete floor and acid stained in contrasting colors. The entry and hallways of this new church are stained with a combination of green, brown and red acid & dye stains. The perimeter scoring provides large blocks of color that follow the long sightlines of the public areas. The lower floors of the home interior are a color combination of one part stone gray and three parts Dover blue. All of the concrete was sealed with an impregnating sealer to give it a natural, organic look. This floor features a 48" tile pattern stained with Kemiko's black acid stain in a 2:1 dilution and a 5:1 dilution. 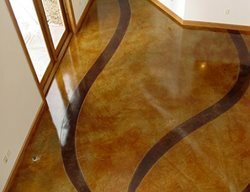 Learn more about ColorChrome from Arizona Polymer Flooring. Learn more about Ultra Surface Metal Fusion from Concrete Solutions. Applied by James Johnson, Las Vegas. Learn more about Ultra Surface Metal Fusion from Concrete Solutions. Custom diamond pattern using Kemiko colors diluted black. To obtain this marble effect, the floor was burnt when it was poured. The floors in this basement were refinished to complement the room's decor. The contractor combined multiple colors in an organic fashion. Get this look using Colormaker's Scrafinoalong with Colormaker Colorfast pigments in burnt umber, verde, cork, charcoal and white (un-pigmented). The concrete that had been placed in this home was seriously defective. It was so soft you could dig a hole in it with your shoe. After a good cleaning, it was primed with a two part solvent based epoxy and broadcast with sand. Once the epoxy had cured a three layer hand troweled micro-topping with integral color was applied, followed by two coats of urethane to complete the project. Citadel Polyurea Coatings were installed in a 10,000 square foot Kia dealership. Citadel's Level Hard Epoxy Hybrid was used on the showroom after shotblasting the floor to prep. Then the two color Medici system with a Poly One HD Clear Top Coat was applied. The system is very high gloss and excellent for showing off new cars. This kitchen was remodeled and updated with Wainscoting finish work on the walls and glass backsplash tiles. 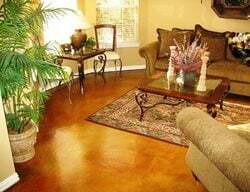 The tan tile floor was outdated and the homeowner wanted something better looking. The surface of the tile was diamond grinded. Then a primer was applied. Using Miracote products, a patch leveler called RMII was applied and used to smooth out the floor and fill the grout lines. Then MPC microtopping was applied. A coat of regular and smooth MPC was applied with a magic trowel and then another coat of smooth was hand troweled tight. The same overlay color was used but at different dilutions to get a layering effect. To get the glossy finished look requested by the homeowner, a 100% solids epoxy was used. Commercial carpet at a golf course was removed, and the underlying concrete floor was scored, dyed and polished. 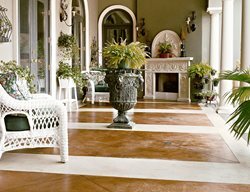 Get this look using Westcoat's epoxy pebble overlay. Photo by Scott Gold of Venture Multimedia. Photo by Scott Gold of Venture Multimedia. This projected consisted of a decorative, multicolored, polished overlay for the Wallace Presbyterian Church in College Park, Md. The 4,000-square-foot project was complicated by a seven-sided floor plan and the need to create a unifying centerpiece. Get this look using a custom-blended calcium-aluminate overlay, aluminum divider strips, white marble and Mother of Pearl, aggregate, penetrating sealer and concrete conditioner from National Polymers, HTC polishing equipment, and HTC Fenix Pads. 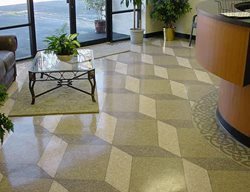 Read about this concrete overlay floor and how it was installed. Rather than hiding ugly cracks and hazing in this concrete floor, their beauty was accentuated. Get this look using a white-tinted filler from Ardex, Formula One lithium densifier from Scofield, and Scofield's Formula One liquid dye concentrate in driftwood. Read about how this polished and dyed floor was finished. Water-based concrete stains add vibrant color to this bowling alley and family entertainment center. Get this look using Scofield's Lithochrome Tintura Stains in Razz-ma-tazz Red, Evergreen, Wheat Grain, and Autumn Honey, and Scofield's Selectseal, a clear polyurethane. 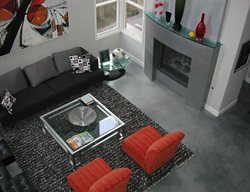 Read about how this floor was done. Decorative resurfacing project on the restaurant floor “Sweet Leaf” in McLean, VA. The floor incorporates a raised logo of two leaves. Along with new finishing techniques, stained floors are now being considered for high profile properties used by doctors, lawyers and architects, such as this uniquely stained floor in the Hampton Family Dentistry professional building. 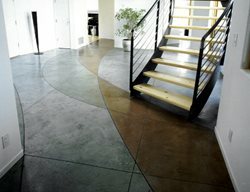 This is one example of a decorative concrete project that adds beauty, uniqueness and color to an office visited by children and adults, alike. Six small exam rooms were stained, along with two wide hallways and a large, four chair examining room. The floor had to be perfect. We applied a clear coat of epoxy over the stain coat and two coats of Key Resin waterborne urethane for a satin finish. The owners were very happy with the results and they get lots of comments on their stained floor. This was a nice epoxy floor we applied last winter for VitroLife (Englewood, CO). They are a pharmaceutical company and this is their storage area. They wanted an attractive floor for client visits. This floor was done with Key Resin. We applied an epoxy primer, a coat of epoxy color and two finish coats of polyaspartic resin. This residential floor was overlayed with Scofield Texture Top, then seeded with glass aggregate, and saw cut into 18" tiles. It was then colored with Ameripolish dyes. The floor was polished starting with 100 metal bond then 100 resin bond, densified with Scofield Formula One Lithium Silicate, then polished to 3000 grit. Finish Coat sealer was applied, then the floor was burnished to 97 degrees. This overlapping squares pattern is stained English Red and Black. It's a residence in Dallas done around 2000. 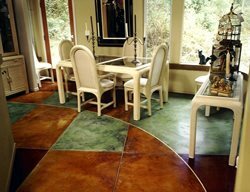 This stained concrete floor was stained using Reef Green and Yellow Decographic Dye on a White overlay. In Chino Hills, Calif., Liz March, a creative stay-at-home mom wanted to remove the existing commercial carpet and create a decorative design floor that would be easier to maintain. Glen Roman used Newlook (Sierra solid color stain) for the base color on the floor and then used enhancers Spanish Clay, Buffalo Brown, and Terra Cotta. Read more about how this project was created. 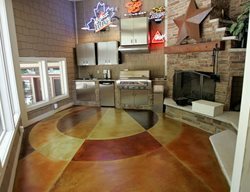 This concrete kitchen floor was overlaid and colored with a custom pigmented mixture, using an acrylic base color together with solvents and acid stains. This kitchen also features a custom concrete countertop. 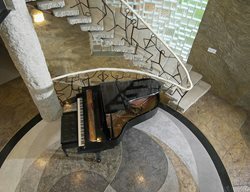 This unique design in a residential hallway was created using an Elitecrete product called texture pave. The artistic mosaic flower tile was inlaid into the surface and the pattern was cut into the surface after it was dry and then stained with water-base concrete stains. The grout lines were then filled with a custom mixed color. 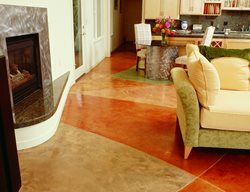 This distinctive residential concrete floor was created using Scofield’s fern green stain. The concrete surface reacting with the stain created this light and dark marbling effect. A. Pellizzari & Company Inc. Heated hydronic white concrete polished floor with deco saw cuts. This concrete floor at Studio H in Calabasas, CA, was stained with Smith Paint’s concrete stain and finished using a CSS Emulsion with a non-slip additive for extra protection and safety. This spectacular floor was created to represent the movement of the Sacramento River and its sandy banks; it is located in the Sacramento Civic Center. The floor was created using acid stains, saw cuts, sandblasting, and epoxy sealer. The new concrete floor in the Sakura Japanese Steakhouse in Columbus, OH received an elegant finish to it floor using an acid stained application of Scofield’s black stain. This 30,000 sq. ft. commercial concrete floor at a printing company in Philadelphia was created using a trowelled down overlay. A 36 “ square tile pattern was cut into the surface and then it was acid stained with Elitecrete’s antique red. This bathroom of a designer show house on the North Shore of Long Island received the look of a traditional marble tile floor through a cement overlay. The tile pattern was laid out on the cement overlay and each tile was individually hand painted to simulate Carrera Marble. The border pattern and accents were also hand painted and silver leaf was inlaid as an accent. This lava effect on a concrete floor was created using an overlay, stains, and stencils. This amazing floor can be seen at the Lava Night Club in the Turning Stone Resort & Casino, Verona, NY. Interior floors of Latitude 43 Restaurant and Bar were stained to create a variegated patina making the restaurant warm and inviting. This concrete floor was stained in Cola, Golden Wheat, and English Red. The lobby of the forestry office in Colorado features a two story water feature, and a stream bed, all made from decorative concrete. Poured concrete over 1/2 inch plywood. The 1,000 sq. ft. floor was stained using a unique spraying technique which Matt Hine describes as key to achieving "a look that is different." 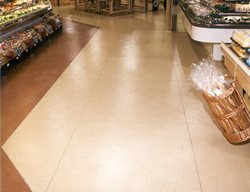 After seeing the floor, the store owner said with relief, "The color just turned out perfect, it's like walking on water." The concrete floor at the Ozone Sports Bar & Night Club in Columbus, OH was fashioned with decorative saw cuts to create the starburst design. The concrete was then acid stained with padre brown and left the natural concrete color in alternating sections of the starburst design. Interior floor using a micro-topping and acetone-based dyes for color. Concrete overlay at Con Agra Foods headquarters. The floor was scored and stained to add a decorative touch. Acid stained and a integrally colored micro topping. Diamond patterns were cut throughout, each diamond a different color, and each color a different dilution of that color. Get this look using Brickform's dye and seal in camel with Brickform stain in sand. Colored new concrete using Kemiko acid stain Malay Tan, solvent-based sealer and wax top coat in family media room. 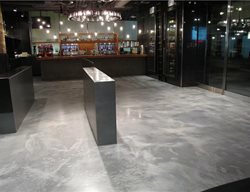 A colored and polished concrete floor with a red border around the edge. This residential concrete, previously carpeted, was stained with Kemiko ‘Black’. The final color is a marbled mix of black, gray-tones and dark walnut, finished with a clear sealer and acrylic topcoat. Custom-mixed acid stains in this master bathroom suite are highlighted by the dark walnut scored border.